As a co-driver, timing is probably your most important job on a rally. From when you leave the first control until you arrive back at the final control, you must be keeping an eye on the time. The timecard must be carefully looked after, and it is your job as the co-driver to make sure that everything written on it is correct. When you ask a Marshal for a time at a Control, after they return your Timecard do not just assume that they have written what you asked for – make sure you check that t hey have written the time that you asked for before you drive off, because if they haven’t, (and some people don’t do as they’re told) you will be unable to change this error later and it may result in you checking in late, or worse, early, and you will be penalised accordingly. The top half is for Competitors Use, and you should use it! 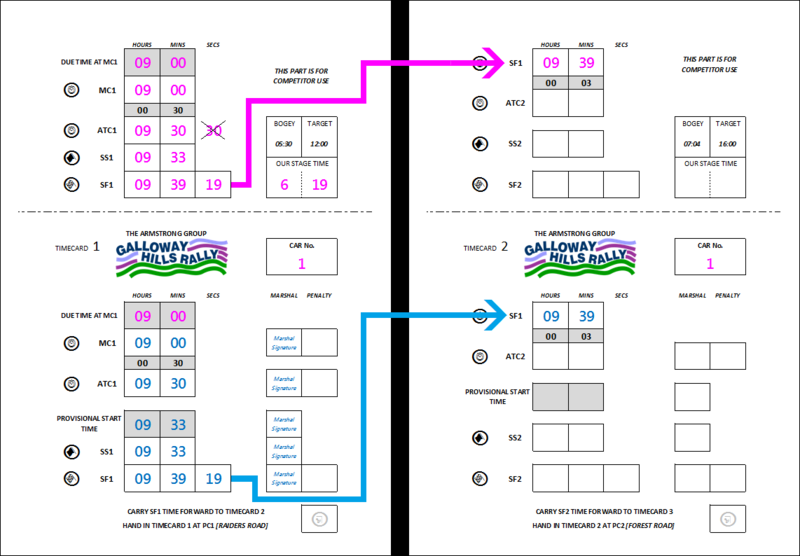 It’s really important to keep a copy of your full timecard, so that you can check your times against the results when they are handed out along the route and at the end when they go provisional, to make sure your times have been recorded correctly. If you think one off your times is incorrect on the Results, it will be much easier for you to say to your Competitor Liaison Officer (usually Jim Brown, who incidentally, is much less scary than he looks) “my side of the Timecard says my Stage Time should be 06:19” rather than “my Stage Time is wrong but I don’t know what it should be” – it will make your CLO’s job a bit easier, and he probably won’t sigh at you quite as much! TIP 1: Timecards s are often smaller than AA5 in size and made of card. 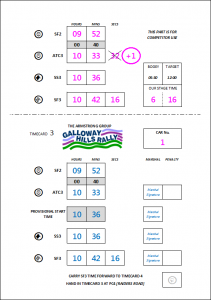 You should attach your Timecard to a clipboard to a] make it easier for you and the Marshals to write on, and b] make it easier to find in your Co-driver Bag. “Times will be recorded to whole minutes on all sections…” [R31.1.3.] so this means that for Road Section timing, only the Hours and Minutes will count, so you will be working with times like 09:30 (nine hours thirty minutes). On a few of the SRC events, “timing will be to the nearest preceding 1/10th of a second” [R31.1.3.] i.e you might get a finish time of 09:30:45.5, but this should be treated in the same way as above, i.e. you ignore the Seconds and the 10th of Seconds and work out your Due Time of Arrival at the next Time Control by adding the Target Time to 09:30. Target Times for both Road Sections and Special Stages will be set at an Average Speed of no more than 30 mph. TIP 2: If there is an anomaly in the given Target Time printed on the Timecard and the Routebook, you should treat the Timecard as being correct. This has nothing to do with trying to beat the Stage Time set by David – many have tried and failed …! The 2013 MSA Yearbook states that “if the stage is wholly on a sealed surface, no Competitor should be able to achieve an average speed of more than 75mph” [R28.1.1.] and “if the stage is run partly or wholly on unsealed surfaces, no Competitor should be able to achieve an average speed of more than 65mph.” [R28.2.2.] A crew cannot set a Stage Time which has a quicker average speed than this. 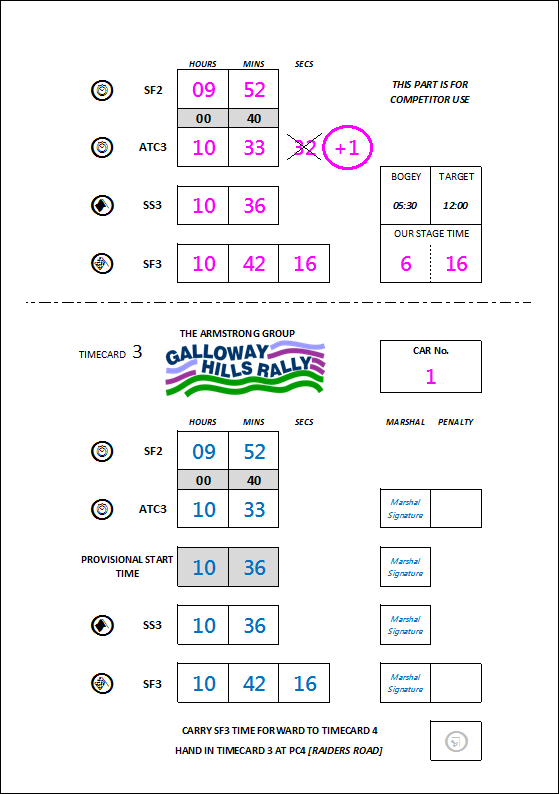 Bogey times for each individual Special Stage will be shown in the Routebook and on the Timecard too. So if we all remember back to Standard Grade maths and “Distance = Speed x Time”; if a stage is 8.00 miles long, the bogey time would be 8.00 (miles) ÷ 65 (mph) = 0.12307692307 (hours) which, just off the top of my head, calculates to 7 minutes 23 seconds. So no matter how fast you might have gone on an 8 mile stage, if you drive your best and set a time of 07:15, the Stage Time you will be awarded on the results will be 07:23. 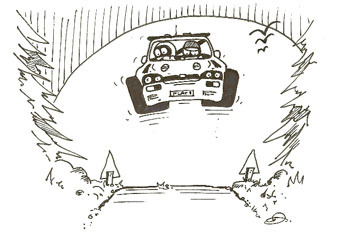 Only in very rare cases will the fastest crews in an event beat a bogey time, and similarly these bogey times are the reason that rally organisers add chicanes to stages; to try and slow down the top couple of cars who might be close to ‘beating the bogey’, because otherwise, after having a really quick run through the forest, they would all finish first equal. 1] 15 minutes penalty free lateness: It’s pretty self-explanatory; you are allowed to have an accumulative total of 15 minutes lateness over the course of an event, before you are deemed “O.T.L.” (Over Time Limit) and you are Excluded from the Results. A good way of adding up how much Lateness you have used is to put the number off minutes late you are at any particular Control next to it [as shown on the diagram below.] If you do this correctly as the event goes on, it will allow you to flick back through your Timecard and quickly count up the number of minutes of Lateness you have used throughout the event. 2] 30 minutes Lateness made up of 15 minutes penalty free lateness plus 15 minutes penalised at 10 seconds penalty per minute late: Again, it is pretty self-explanatory; you have 30 minutes of Lateness for the event. If for example you are 29 minutes late to the Arrival Control of SS1, firstly your day is off to a terrible start and can only get better, and secondly, you will have used the full 15 minutes penalty free Lateness plus 14 minutes of the Penalised Lateness, so you will be awarded a penalty of 2 minutes 20 seconds (14 x 110 seconds). You can then only be one more minute Late at any Control for the rest of the event, or you will be O.T.L. On some longer events that last for more than one day, Lateness may be ‘reset’ when you reach a Main Time Control. This means t hat you will have the amount of Lateness for the event to use between every set of Main Time Controls. Again, you must read the individual event Regs to see what is allowed. Usually on a SRC event, only the first and last Controls are ‘M ain Time Controls’ so this rule will not apply, but it’s good to know it anyway! We have covered [A] in Section 3 above about Bogey Times, and [B] just relates to setting a normal Stage Time. We will focus on [C]. If you have a problem and your time in the Imaginary Stage is 23 minutes 15 seconds, your Stage Time on the Results will be 16 minutes, but you are 7 minutes over this Target Time for the Stage, and therefore, have used 7 minutes of your Lateness. Remember to note on your part of the Timecard that you have used 7 minutes of Lateness allowance. This is the definition as per the 2013 MSA Yearbook. S Some events may change this in the Supplementary Regulations. TIP 3: If you have been Late, you can’t decrease your Lateness by checking in to Controls early! 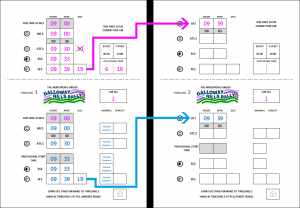 A Passage Control will usually occur after every Special Stage, where a Marshal will collect your latest Timecard too allow your times to be passed to the Results Team by phone or radio. It is very important that before you hand your Timecard in  you have copied all of the Times to the part you are keeping, and  the final time on the Timecard you are handing in has been carried over to the top of the next Timecard correctly [as shown in pink and blue on the Timecard diagram below] – even the best co-drivers have been n caught out this way! The Marshal at the Special Stage Finish may write this time in for you, but again, you should make sure they have transferred the correct time. TIP 4: on rallies where there is a shortage of card (! ) they may not give you a Competitor Section of the Timecard to retain, and as many of us now have Smartphones with a gazillion megabyte camera, it is a good idea to take a photo of your completed Timecard before you hand it in at a Passage Control. This means you have a copy to check results against later on in the day… this may make Jim happy too! The yellow advance control board signals the beginning of the Control area. The red control board is where the Marshal will enter your Arrival Time on to your Timecard. The yellow advance control board signals the beginning of the Control area. 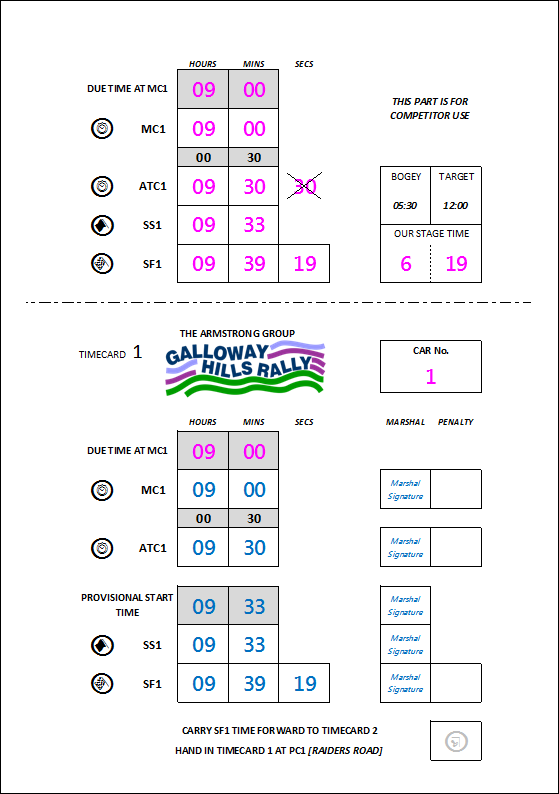 The red control board is where the Marshal will enter your Special Stage Arrival Time and your Provisional Special Stage Start Time on to your Timecard. The red Start Control board is where the Marshal will enter your Actual Special Stage Start Time on to your Timecard, and initiate the ‘launch’ procedure and count you down to Start. The yellow board shows that you are 100m from the Flying Finish -this is just a warning board – don’t stop here! The red board shows that you are at the Flying Finish (where they stop the clock to attain your Stage Time) The countdown boards show that you are 300m , 200m, 100 m from the Special Stage Stop Line –– Slow Down . The Stop Line is where you stop for the Marshal to enter your Special Stage Finish Time on to your Timecard. The relevant section of the 2013 MSA Yearbook which relates to Control Procedure is R30..2. 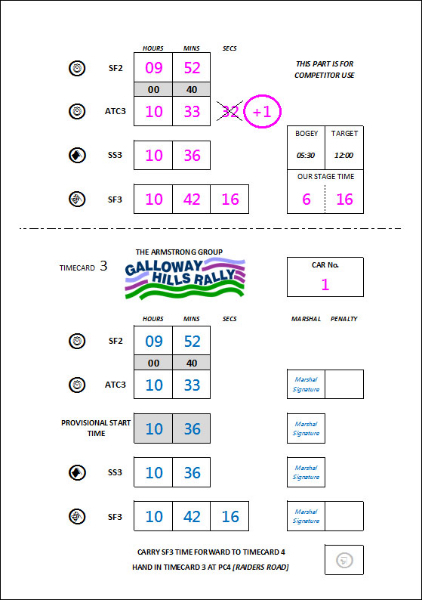 When you arrive at any Control on a rally [for example, the Start/Finish, Service Area INN and OUTs, or a Special Stage Arrival Control] you will wait at the yellow advance control board until it is time to go into the Control i.e. up to t he red board where the marshals with the clock will be stand ding. If there is a queue, it is your responsibility to get out and walk. So, although you are permitted to enter the Control (drive past the yellow board and up to the red board) on the minute preceding your Due Time, you must not hand your Timecard to the Marshal until the Minute of your Due Time of Arrival at any Time Control.